WordXpress used to be known as Fiddler Online. They were hyper-focused on first designing and building WordPress websites, then maintaining and supporting them. They had been doing that for most of a decade. Just last year they got more requests for maintenance & support of existing sites and realized there was no reason they couldn’t do that. The more they researched, the more it seemed obvious that should be their focus. So they have dropped the design and build portion, and are focusing solely on the maintenance and support they have been doing for 9+ years right now. Along with that, they decided to rebrand as WordXpress since it’s just a great name and conveys the fact they only work with WordPress. WordXpress team is made up of four WordPress and design gurus plus one as-needed developer, at the moment. Two of them are in the US, with two in the Philippines. As they grow, they hope to add team members in more time zones so their team can work regular hours, but their members will be covered 24/7. Want something changed on your #site? Interested in improving your #SEO or online #reviews? Worried about #security? #WordXpress can help you! Tevya Washburn finished earning a bachelor’s degree in history in 2007. He went to work for a bank, thinking he was going to get an MBA next. He didn’t enjoy the corporate work environment. 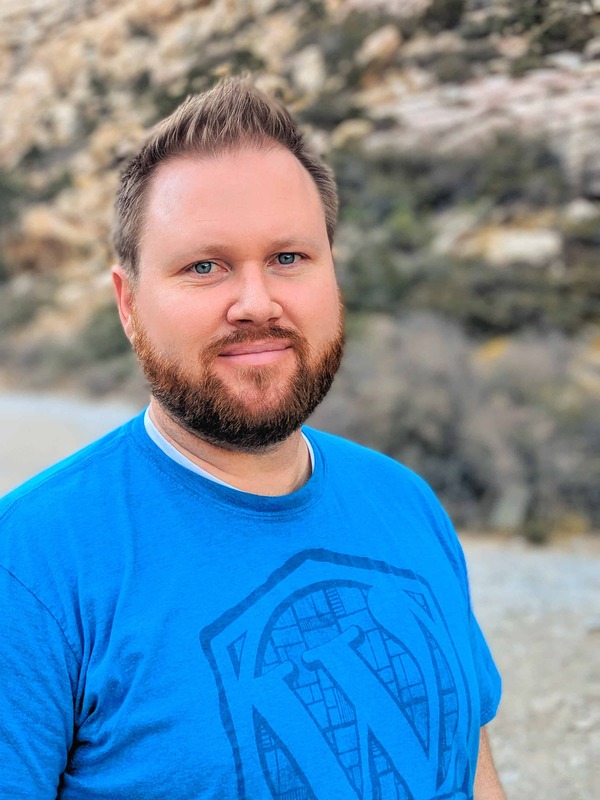 He realized that he’d much rather design, build, and maintain WordPress websites, something people kept asking him to do for them. So he went part-time at the bank and eventually became full-time self-employed as he grew his business. A short time into it, he sat down with a client and tried to teach them how to manage and maintain their newly-built site going forward. He thinks he is at least a decent teacher, but he could tell there was ZERO chance this lady and her husband would remember how to do anything with their site, in 3 months when they needed a change. He realized then that although WordPress was a great solution that made his life easier, it was still over the head of your average person. (In some ways it’s made huge improvements since then, but still presents a significant learning curve.) It was at that time that he thought up their business model: they’d just build-in ongoing maintenance and support to their pricing and have them pay them monthly, rather than 1-time. 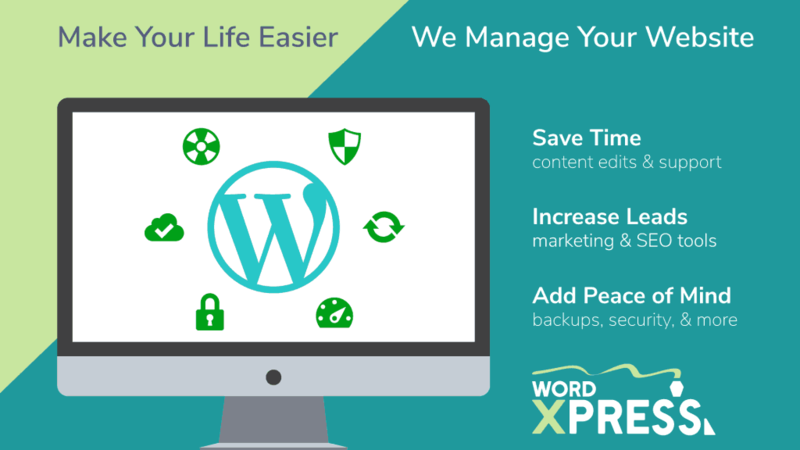 Services: Content Edits & Updates, 24/7 Monitoring, Cloud Backups, etc. We have a few things that we feel makes us stand out. First, we’re obsessed with taking amazing care of our members and making sure each feels appreciated and that their website needs are more than met. In fact, just 2 nights ago, one of our team members stayed up all night until 4 am, working out some issues that had arisen in transferring a member’s site to new hosting. They had a sale they wanted to run the next morning on their WooCommerce store. Since we said we’d have it ready by then, this team member stayed up until the job was finished and everything was ready to go. We had no way of knowing those issues would present themselves when we told them we’d have it transferred by the following morning, but we’re determined to deliver on our promises, so we did what it took. Second, we’ve been managing, maintaining, and supporting WordPress websites for almost a decade now. Another way to put it is that we’ve failed at WordPress way more than most people and companies. We’ve made lots of mistakes and are really great at learning from our mistakes. That means we know the best way to manage WordPress and how to avoid the pitfalls of WordPress and hosting. Along with that, we’re designers first. Many services in the same vein have mostly developers on their support team. That’s great if you frequently need custom code written to fix your site or custom plugins on it. But most people and businesses need content updates to the pages, posts, products, podcasts, etc. that everyone sees on the front-end of their website. As designers, we ensure each change or tweak matches the design and feel of the rest of your website. Third, we include marketing tools and services with our maintenance plans. On our plans, we’ll install and setup premium plugins like Starfish Reviews to help you get more positive reviews for your product or service Plus others like WP Review Slider Pro to display your reviews, Gravity Forms for lead capture and spam-free contact forms, and WP Rocket to ensure your site is as fast as the Flying Scotsman. As I mentioned, we’ve been doing this for almost 10 years as of this interview. So we’ve become experts through hands-on, real-world, working with WordPress on all kinds of different websites and solutions. We’ve learned a ton by failing fast and learning from our failures. Personally, I started looking for a better way to design and manage websites than the old FrontPage, HTML, Dreamweaver, and FTP methods I’d used for years. I was sick of how painful it was to keep a design consistent across pages unless you used frames, which nobody liked. So I started hunting around. I tried Drupal some, and I think Joomla as well. But both were so difficult to work with, there was no real advantage over the old methods, at that time. I finally found WordPress. And pretty quickly realized how powerful it was, partly because of its comparative simplicity. It got me really excited. After building my first website on it, I was hooked. I started moving all the sites I’d built over to it, and things grew from there. Eventually, I realized I had quite a side business going building and maintaining WordPress websites, and that I needed to quit my day job and pursue what I loved. For me, it was hosting. I’d managed to get on some pretty horrible hosting really early on, setup by a guy I should not have trusted. Our sites went down time and time again, with all kinds of issues that should never have occurred with the kinds of resources that VPS had. I tried moving to other hosts, but they’d usually do a full cPanel migration. That caused many of the garbage and problems to migrate with our sites. It was a nightmare that would reappear every 6 months or so, and cause all kinds of problems including downtime for our members’ sites. We even used WordPress Multisite for a while, then eventually got away from that as it played into the issues as well, creating a single point of failure for all the sites we hosted. As bad as it was, I learned tons about WordPress and how it interacts with the server and the software stack running on the server. Eventually what fixed it was my team and I hand-migrating each WordPress install to new, cloud-based servers through CloudWays. They have a custom stack and custom admin panel. So we were able to leave all the cruft behind, finally, and have had very few problems since that time. We’re with Flywheel now. But getting away from cPanel and the typical LAMP stack is what finally and permanently resolved the issues we’d had. Now I use my knowledge of hosting to help our members get setup on great hosting that fits their needs and avoids the pitfalls we experienced. Getting distracted by things that are urgent or interesting, but not essential. I often have a plan for the day of 2 or 3 strategically essential things I need to accomplish each day. But often something entirely separate will distract me and lead me down a rabbit hole that’s tactically important or interesting, but not essential for me to take care of that day. I forget to resurface and look at the big picture. For example, a client will have a technical issue, and I’ll dive in and start testing and tinkering to figure it out. In reality, I might need to give it a cursory look, but should actually have one of my team takeover, or if it’s a hosting issue, just open a ticket with the host. I like solving problems with WordPress, and my extensive experience and knowledge mean that I’m often the person who can figure it out the most quickly. However, that robs my team of the chance to gain the same experience and knowledge that I have. It also prevents me from focusing on our overall strategy and doing the things that nobody else on the team can do. This answer is a little easier for me than some since we include a number of premium plugins and services with our plans. Since it’s for our members, we don’t have to talk about what might have been the most important: iThemes Security or Gravity Forms or All in One SEO (yes, we still prefer that over Yoast). So I can be creative and recommend one that many may not be at the very top of my list if it were a recommendation for everyone: Subscribe to Comments Reloaded. This plugin allows people to subscribe to replies when they comment on posts. It’s powerful because people who take time to comment are engaged. They’re followers. So sending them an email to keep them current on the conversation and coming back to your post, is a great way to build engagement and customers. We’ve been using it for many years on our sites as well as many of our members’. It’s a great plugin that works well and is standalone, so you don’t have to install JetPack or have Automattic/WordPress.com manage your comment subscriptions. It’s also portable, so if you migrate content to a new site, you can migrate those subscriptions along with it. That last one is very important if you ever rebrand or get bought-out. Currently, we use both MainWP and ManageWP. I have used InfiniteWP in its early days but didn’t like having to learn a whole new interface (that wasn’t very intuitive) or the fact it wasn’t open-source. As I mentioned, we also used Multisite for some time, to give us this same kind of control and bulk-actions that these tools provide. MainWP is great, open-source, runs on top of a WP install, and has a fairly familiar interface. If you buy their bundle deal, you get all the premium extensions for a one-time purchase. The one downside, in my opinion, is troubleshooting and support can be cumbersome and even painful since you have to grant them access to your dashboard site and a child site. Then you have to go-between them and your host, and all that. Since our team is small, we like tools that multiply what we can accomplish, not place more drain on our time and efforts. Overall MainWP is a great multiplier of our efforts, but any time there’s an issue, it really shrinks in value. For that reason, we’ve started using ManageWP, which is a hosted SaaS web app. So if something goes wrong on their app, we just report it, and then it’s on them to take care of it. More often than not, their internal monitoring tools mean that they know about problems and have a fix in place before we do, or know just how to fix the issue when we report it. ManageWP’s support is really good and very fast to respond. The downside is that it’s much more expensive than MainWP. So we’re using both at the moment. But are looking to migrate everything to ManageWP eventually, because of the time and focus that we’ll save. It goes right along with our philosophy on hosting and all our tools: we’d rather pay more for hosting we never have to worry about than save lots on hosting, but have downtime and hassle trying to fix it when things go wrong. Multiplying our efforts and having everything run smoothly is vital to a great experience for our members and allowing us to scale without costs becoming overwhelming. There are none that we absolutely won’t work with. But there is a number we’ve come across that are still running outdated and insecure versions of PHP (anything prior to 5.6) and other software. I’ve personally had terrible experiences with support and hosting stacks from some of the biggest names like NetworkSolutions, 1and1, and Godaddy. I’ve also seen pretty terrible practices from Fatcow recently, plus a few I forget. When we encounter one that’s really creating lots of problems or has an outdated stack that’s not secure, we just work with the client to get them on some better hosting. There are three hosts that we typically recommend: CloudWays if you want the least expensive. They’re pretty good and quite flexible for various needs. They support many apps, not just WordPress. So you won’t get as good of WordPress-specific support, but it’s hard to complain about the prices. Flywheel is our mid-range option. They do excellent WordPress-only hosting and have amazing support. They’re great for designers and non-techies because they prevent access to most WP core files and provide simple options in their custom dashboard. Flywheel makes WP hosting easy. Kinsta is our most expensive option, and best for developers who want fast, secure, stable hosting. They run everything on Google Cloud (which Flywheel is moving to) and have a robust dashboard and many more options and features that Flywheel locks down or doesn’t allow you to customize. We have one member that had about 80 active plugins when we started managing their site. We got that down some. But lots of people put a big emphasis on the number of plugins. It’s really more about what the plugins do and how much code they’re running and how well written they are. For example, if you install JetPack and turn on all its options, that’s a lot of code, but technically only one plugin. Many plugins can be just a few small tweaks and really have zero negative performance impact. So really looking at the number of plugins is looking in the wrong place. Instead, we recommend starting with the eye-test: is it slow? Or if you’re not sure, using a tool like Pingdom speed test. If it is slow, then something like the Query Monitor plugin is a great way to figure out what’s slowing a site down. The other day I realized one of our own sites was slow, but only in the admin. I used Query Monitor and found out that two plugins from the same company were checking their license key against the company’s licensing server, every time any page in the WP admin loaded. It was adding anywhere from 1 to 3 seconds of load time to do the 2 checks! I messaged them about it, and they’ve since pushed out updates for both plugins. Now it only checks when you’re on the licensing page. This improved performance a bunch and I didn’t disable a single plugin. As I mentioned, we try to take amazing care of our members, and they often refer their friends and vendors to us. Most of our business comes via word of mouth like that. That includes other WordPress developers and designers who either don’t want to manage and maintain the sites they build. Everything else they refer to us. We have an affiliate program, so they can get something in return for sending referrals our way. We also try to get on various blogs and publications like this one, so people can learn more about what we offer and get a feel for us and how we do business. Plus, we write a lot of great WordPress tips, hacks, ideas, guides, and more on our own blog. People often find those, then learn more about our plans and sign up for a plan including having us implement the subject of the blog post on their site. Yes, most definitely! I think the WordPress maintenance industry is still young. We’ve been doing this full-time for 8 years now and plan to continue growing for many years to come. The WordPress space is only growing larger. I also believe that as Gutenberg and it’s design and UX philosophy takes over the WP admin, that WordPress will become much easier to use. However, because of open and flexible nature of WordPress, there will always be plenty of need for more technical people to help those who are less technical or just don’t want to bother with managing and updating their website. All these factors mean there will always be plenty of space for WordXpress to continue to serve its members and grow. Published on September 25, 2018 by Ivan. Filed under: Interview, WordPress.